That was me a couple of weeks ago as I floated in 10″ of water filled with approximately 1,000 pounds of Epsom Salts in the dark. My partner surprised me with a trip over to (Float Nashville). 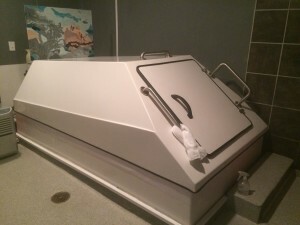 I had never experienced any type of sensory deprivation to that degree before. As I floated in the water, my mind was everywhere at first but then as I continued to breathe an amazing thing happened…I became peaceful and one with the water. Our breath is amazing! If you think about it, it’s what keeps us here. How many times do you ever just stop and give gratitude for your breath? It something that most of us never even think about because it’s so natural but our breath is a really big deal. It’s our life force. It clears our lungs and fills our organs with oxygen but it also stills the mind and allows us to relax. A lot of times we are so on the run that we don’t have time to sit still and meditate, however we always have time to breath. Heck, we are already doing it! So my challenge to you this month is to breath deeper and longer. Besides, it’ll help you manage all of the energy updates. 🙂 And, if you find yourself in Nashville go visit my new friends Amy and Mark at Float Nashville. They’ll make sure you are well taken care of. Float On!